Speedway, motorcycle racing on the tracks of similar shape to an oval, one of the disciplines of motorsport. Speedway riders usually race by four laps, with a mass start, riding on a track always in the opposite direction to clockwise. 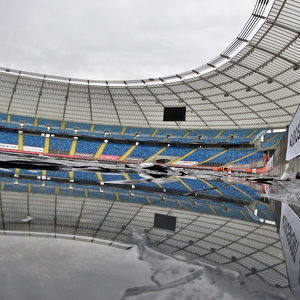 Tracks used for competitions have loose surface, and special speedway motorcycles do not have the transmission or brakes. Polish name “żużel” and popular term black sport derived from the times when on the tracks there was used only black surfaces, now superseded by a special blend of syenite and granite. The world's sport is known as speedway. 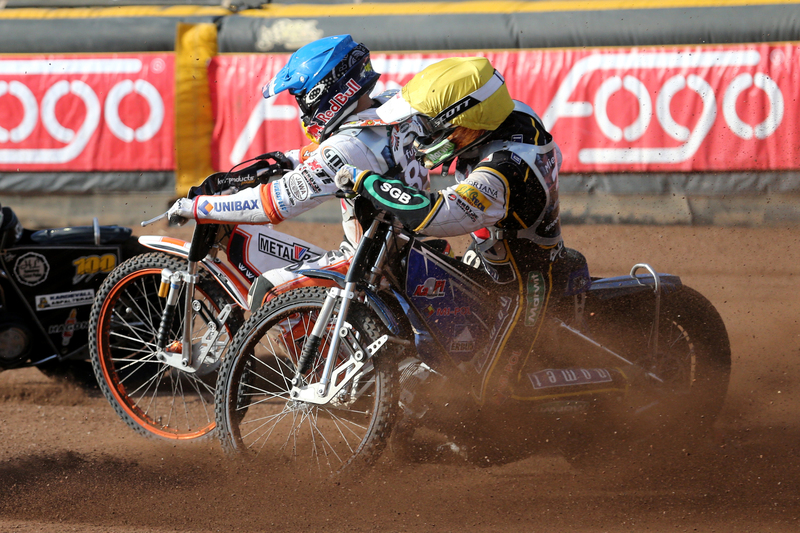 Players starting in speedway events are equipped with a special suit made of kevlar (formerly leather), protecting against the effects of falls and mechanical damage. On the left shoe speedway riders have a special metal cap, so-called skate, supporting overcoming bends in a controlled slip. Obligatory equipment of a rider is also a helmet with goggles equipped with the so-called skidding, or disposable foil that can be easily shed during the race to clean up contaminated goggles of floating fragments of surface from the tires. Color of a helmet or cap put on the helmet is strictly defined by the rules of the competition, which is intended to facilitate the identification of riders in a race. In addition, riders are required to have plastrons (special vests). Before the beginning of a heat a referee turns on the green light in the pits for riders, allowing for departure from the pits, and the orange light is usually turned on with timing. Riders have two minutes to take places in the correct order (according to the heat table) at the starting line. Any rider who is late for the start, is excluded and in team competitions cannot be replaced. The correct setting of the riders before the starting line controls the director of start, at the moment of start of a heat has to stand between riders on the starting line. Readiness for start is issued by referee by lighting a green light. At this point, the riders stand motionless, holding the clutch, throttle opening through the throttle grip, expecting to raise tape. Run begins a referee, releasing - through the desktop in the turret of referee - the tape, most of which is held by electromagnets. At the moment of raising the tape, riders release the clutch and start the heat. The characteristic movement of heads of riders in the mechanism which holds a tape immediately after lighting of green light is due to the fact that observation until release the electromagnets, allows faster to release the clutch and consequently faster start. The current rules do not allow speedway rider to touch the tape after the ignition of the "green" light (a rider is excluded from a heat). Touching the tape earlier does not bring any consequences. A referee decides about the exclusion individually! In case when an event is observed by television cameras, before deciding referee has the right to watch replays of the heat. The rider who is excluded cannot take part in the re-run - the heat is held in part line - up, in the case of individual tournaments and in some leagues, a reserve can appear on a track. By winning the race, a rider scores 3 points, the second at the finish line - 2, the third - 1, the last one - 0.